What does it mean to adopt a special needs animal? What do we mean by “special needs”? In reality all animals need special care and love. Special needs pets just typically require a little extra time and energy, especially as they get older and the disabilities may become worse. These animals take a special commitment, as they often need more follow up care. The above list is not comprehensive of the issues or diseases that may arise but gives you an idea of what you can expect. Providing a loving forever home for a special needs animals is a tremendous reward. If you adopt one of these wonderful animals, SMART will always be there to support you by providing advice and guidance. Please contact us for more information on making one of these “special” animals a part of your family. THERE’S ABSOLUTELY NO REASON WHY FIV CATS SHOULDN’T HAVE A CHANCE FIV (feline immunodeficiency virus) is an often misunderstood and wrongly-feared autoimmune disease. FIV progresses very slowly, gradually affecting a cat's immune system. FIV-positive cats can live healthy, happy lives for many years when properly cared for. They can even live with the other healthy cats with very little risk of spreading the disease. MANY FIV CATS LIVE LONG, HEALTHY LIVES AND NEVER SUFFER ANY ILL EFFECTS It is impossible to accurately predict the life expectancy of a cat with FIV. FIV-positive cats have tested positive for the virus but the virus is not necessarily active. If the cat is young and healthy, it could be completely symptom free for several years. As long as cats with FIV are not exposed to diseases that their immune system can't handle, they can live perfectly normal lives. • FIV is a slow virus that affects a cat's immune system over a period of years. FIV cats most often live long, healthy, and relatively normal lives with no symptoms at all. If the cat is young and healthy, it could be years before anything changes. • It is important to keep their immune systems healthy. Make sure their vaccinations are up-to-date vaccinations, keep them indoors, feed them a high-quality diet, and seek veterinary treatment at the first sign of illness. There is currently a vaccine available for FIV, but you and your veterinarian should decide together whether or not to vaccinate your cat. • FIV is a cats-only infection and is not transmissible to humans, dogs, or other non-felines. There is no threat to families even if an infected cat scratches you. • FIV is not easily passed between cats. It cannot be spread casually - like in litter boxes, water and food bowls, or when snuggling and playing. It is rarely spread from a mother to her kittens. • Cat-to-cat transmission in multiple-cat households where there is no fighting among cats appears to be quite uncommon. If properly introduced, you can safely keep an FIV-positive cat with FIV-negative cats if the cats get along well together. Careful monitoring of the cats’ behavior and minimizing the likelihood of fights is recommended. HELP SHATTER THE MYTH THAT FIV CATS ARE UNADOPTABLE Cats with FIV are all hoping for a hero - someone to love them. And every day, there are people out there who heed the call. Given the opportunity, their potential to change your life is unlimited! If you can find room in your heart and home to adopt one of these amazing cats, please contact us for more information. Valkerie is FIV+. It is best that she is an only cat. 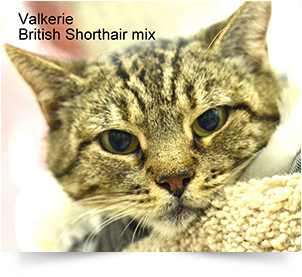 Valkerie is a beautiful British Shorthaired Tabby mix. She has a very large, round head with chubby cheeks that add so much to her character. She has a compact build with short legs. Very muscular . Her face is expressive! Sometimes she looks grumpy when she's not. She's a cat that loves to be cuddled a stays very close. She will sit looking at giving you a silent meow to let you know that she wants to sit on your lap. She would work well with children and do fine with dogs. 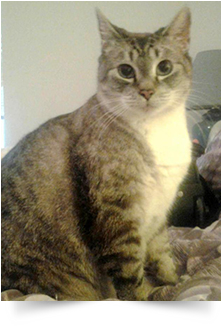 Click Here to learn more about FIV. Precious is just that..... She is a spayed female Siamese Lynxpoint cat with beautiful blue eyes. Precious is a Special Needs cat because she is FIV+, which is not as bad as it sounds. A FIV+ cat lives a normal, long life when kept indoors and well cared for. FIV is only spread to other cats by deep bite wounds associated with fighting. Precious is healthy and extremely loveable. She is definitely a lap cat. Jasper is approximately 2 years old and he is a super sweet guy. 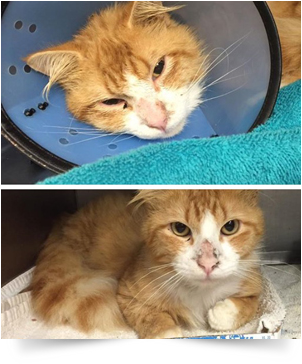 He came into the shelter as an injured stray and needed a hind leg amputation. He is scheduled to get his sutures out this week and will have a couple more weeks of recovery before he is ready for adoption. We always need more fosters for our kitties in recovery and for litters of kittens. If you have a spare bedroom or bathroom, please consider fostering.